Dali II - The COST-EFFECTIVE care bed. The "Dali II" care bed is sturdily constructed to stand up to the rigours of daily nursing care. 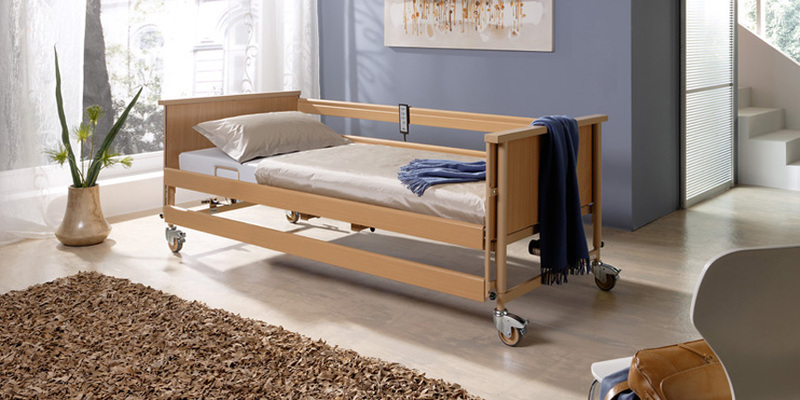 High-quality components make this a particularly durable, robust and low-maintenance care bed that significantly reduces follow-on costs. COST-EFFECTIVE /Easily assembled by just one person. This bed offers exceptional value for money, but not at the expense of materials or design. Uncompromising use of high-quality materials is a hallmark of the Burmeier philosophy. The care bed can be assembled and disassembled by one person without tools in a matter of minutes. Residents are provided with optimum protection as all live 230-volt components are kept away from the bed. SIDE RAIL FALL PROTECTION approx. 38 cm. Mattresses and anti-decubitus systems up to a maximum depth of 16 cm can also be used without the need for adjustable side rail extension kits. In many cases, costly height extensions are not required at all.